Screenshot of a video report by the BBC's Richard Scott showing the interior of SpaceShipTwo. The video makes it clear that SS2 is still very much a work in progress: the interior is barebones, lacking even seats (although the fittings where the rotating passenger seats will be installed can be seen). 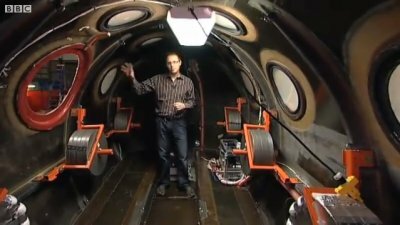 The video also helps illustrate the relatively modest size of the cabin. While Scott is able to stand up normally in the cabin, it seems likely it will look a bit more cramped when fully outfitted and containing six passengers; he notes in the article that the cabin’s size “will probably mean them bumping into each other” during the weightless portion of the flight. The date of the video isn’t specified, but it shows SpaceShipTwo undergoing a fair amount of interior and exterior work at the time: the vehicle’s nose, for example, was removed. One interesting note is something made in passing by Scott about SpaceShipTwo: “It’s going to be taking paying passengers into space from hopefully 2013.” That’s later than previous reports, which have suggested that Virgin would put SpaceShipTwo into commercial service next year. SpaceShipTwo, meanwhile, hasn’t made a glide flight since mid-January, according to Scaled Composites’ flight logs, although two attempts for glide flights in mid-February was aborted because of weather conditions. Very cool! It’s always fun to get a look at these vehicles halfway disassembled and see the details. At first I was thinking that the video was shot before the first flight given the state of disassemble and the lack of pilot seats but Pete Siebold did say in the second video that he’s flown it a couple times so maybe the video was shot in the last month or two? It might explain the lack of test flights in March, that they needed to do work that required the removal of the seats, leading edge panels and etc. Also of note is the weight lifting ballast in the back to simulate the weight of passengers. That would not have been there for a first flight, but makes sense that they’ve made it that far in their envelope expansion. I’m looking forward to the next test flight and looking forward to the flight where they put the feather up for the first time. Hopefully they get some high resolution pictures of that sight! Enough with the speculation already. I watched the LIVE satellite linkup from London to mojave on Thursday afternoon (UK time) during which I seem to recall the reporter mentioned that he took a look inside the spacecraft _yesterday_. I recorded it and can double check when I get back in front of that computer.